I’ve been slowly scanning my old journals into my computer. I’m worried about my old composition books slowly disintegrating, getting lost, or being destroyed in a natural disaster (cats). On Thursdays, I’ll be digging into the archives of Past Loraine to give you some of those awkward gems. I’ve already started this process on social media, so here are the first two, in case you missed them. Not just ants. 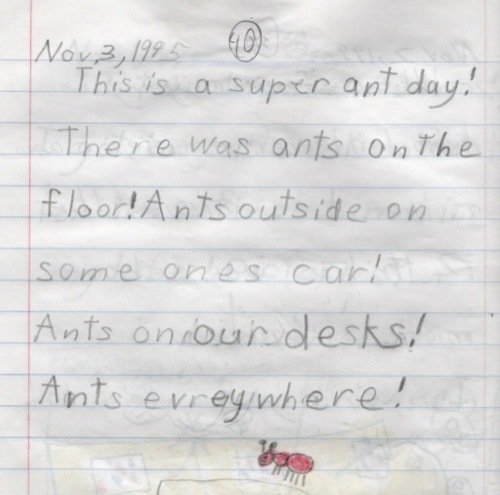 Super ants! Second grade. My childhood self was so silly. 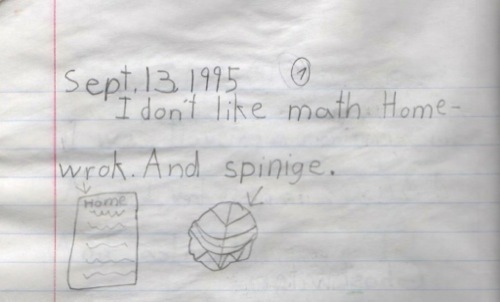 Math is awesome and spinach is delicious. This was before Napoleon Dynamite’s liger was a thing.